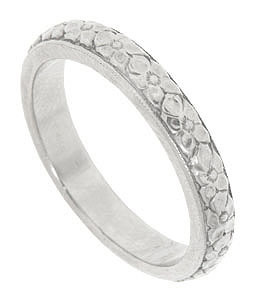 Repeating patterns of forget-me-not wrap around this Art Deco 18K white gold wedding band. In the interior of this ring it says, "KR to CT 7/16/29". Circa 1929. It measures 3.5 mm wide. Size 9 1/4. Can be slightly re-sized.